Vision: Sustainable communities with exceptionally attractive living environments for all. No cars, trucks or busses. This can be accomplished by serving intra-community travel needs with a PRT system and leaving cars, motor homes, boats, etc. on the periphery. Low capacity building station A station for every building. This is readily accomplished in areas of dense development. 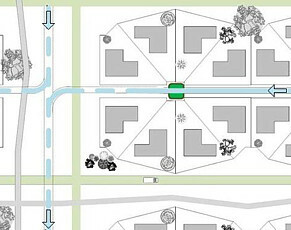 In less dense development clusters of houses could share a station in the back yard of each. Links to parking and transit. The PRT system should provide convenient links to access private vehicles at peripheral parking lots as well as to transit systems serving legacy portions of the city. PRT freight vehicles. All freight should be handled by PRT vehicles. 2getthere's freight vehicle All buildings sprinkled and equipped with built-in ladders. This serves the dual purpose of reducing fire damage and reducing the need for mobile fire-fighting equipment. Refuse and mail on PRT system. The system should be designed to automatically pick up refuse and deliver mail. Emergency responders use specially-equipped T-Pods. Fire fighters and emergency medical technicians travel in specially equipped T-Pods (or groups of T-Pods) capable of accommodating mobile equipment and gurneys. Shared station for single family homes Home automobile access by special permit. In order to allow people freedom to do things like work at home on their vintage cars, permits should be available to allow them to occasionally drive at low speeds on the footpaths or aggregate-turf roadways to access their homes. All T-Pods under continuous CCTV surveillance. This standard PRT requirement should help dramatically reduce crime. Robberies and kidnappings will be difficult when the getaway vehicle is a T-Pod under surveillance.